Cons • Available only direct from Asoka in U.S. 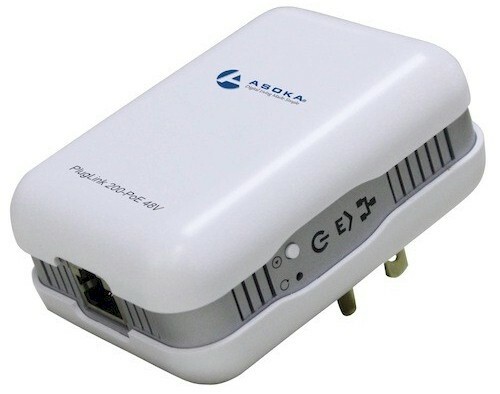 The concept for Asoka's PlugLink PL9660-PoE powerline adapter is simple: take a 200 Mbps HomePlug AV powerline adapter, add an 802.3af Power Over Ethernet injector and put them both in a compact, affordable package. That's about all there is to it. The PL9660-PoE is a bit large by today's compact powerline adapter standards, since it has to accommodate additional circuitry for its PoE function. But as the photo below illustrates, it is thoughtfully designed to occupy only one outlet of a standard U.S. duplex. The smaller device is a PlugLink PL9660-Q1 that Asoka sent as the PoE's test partner. Everything you expect on a 200 Mbps HomePlug AV adapter is there as shown in the callout diagram below. Yes, the port is 10/100, not Gigabit Ethernet. The smaller PL9660-Q1 doesn't have a reset button. Its Security button is on the top, flush with the top cover. The Powerline Link / Activity light on both adapters supposedly implements the (what is now) standard Green / Yellow / Red throughput (actually link rate) color scheme. But I've yet to see the color actually change in this or any other adapter that allegedly supports this scheme. The inside of the PoE version has two boards sandwiched together. You can't see the powerline devices in the photo below—it appears to be mostly power circuitry. When I downloaded and ran Asoka's PowerManager 1.89 utility, the PoE's Firmware version revealed an INT6000 MAC. The INT6000 is a fairly old 200 Mbps HomePlug AV MAC/PHY device dating from Intellon's pre-Atheros-acquisition days. It requires a separate front end, but I didn't take the adapter apart to find out which one. The PlugLink Q1 version is a single level board, with a QCA-branded device clearly visible at the top middle of the photo. I looked for the smaller analog front end companion, but couldn't find it. The reason for this became clear when I checked the part number on the device: QCA6410. The reason I couldn't find a separate front end chip is that the QCA6410 is a single-chip 200 Mbps powerline device announced at the beginning of 2012.